Last night was a big night for Young'un and his Cub Scout pack. It was their end-of-the-year banquet. I look forward to this every year...and not because of the fried chicken. The look in those boys eyes as they are recognized for their achievements is priceless, shear delight. Notice now nice Young'un stood while his Cub Master pinned the Webelos colors and activity pins on his sleeve! The second picture is when they were all pinned, badged, fed, and finished. He worked real hard this year and that earned him nine activity badges. He earned badges for fitness, citizen, showman, geologist, readyman, family member, craftsman, communicator, and athlete. He also earned his Webelos patch and Compass Point emblem. We are very proud of his accomplishments with the Boy Scouts of America and look forward to his advancement on to Webelos II and his Arrow of Light. We are happy for all of the boys and their accomplishments! They are a fantastic group of youngsters. A special heartfelt thank you goes out to Kim Clark (Young'un's Den Leader) and Chris Schneider (Cub Master). If it weren't for such fantastic parent volunteers, children in our community would be severely lacking. Again, congratulations to the whole entire pack for a wonderful year! Job. Well. Done! This year the Kid decided to step it up a bit and not only take his Mille Fleur d'Uccle trio, but also turkeys and breeding sheep. Quite a busy time for him! He and his Mille Fleur d'Uccle trio was awarded second place in the senior fancy chicken category. He showed a pair of young Royal Palm's as his turkey project. They looked fantastic! He and his turkeys were awarded second place in the turkey division and also Reserve Grand Champion. He is looking forward to showing both again next year. The Kid took five sheep as a breeding project this year. WHEW! Quite an accomplishment for someone who had not shown sheep before. Even so, he did a great job. He showed Badge, Little Man, Dandy, Z, and Puppy (Buck). Buck is now living with a wonderful family in another area of Ohio. Badge was awarded the Breed Champion ribbon, along with the overall Champion Breeding Ram trophy. Little Man was awarded the Yearling Breed Champion Ram ribbon. Dandy was awarded the Yearling Breed Champion Ewe ribbon. Z and Puppy (Buck) were awarded the Breed Champion ribbons for ewe and ram lambs. The Kid showed Little Man, Dandy, and Z as a trio against many other 4-H members and were awarded the overall Champion Sheep Breeding trophy and banner. We are so proud of the Kid and all of his accomplishments. He had a fantastic year at the fair and worked hard with all of his animals to prepare them for their week there. This year the Kid showed his Mille fleur d'Uccle chicken trio through 4-H and also completed an Exploring our Insections I project. He, along with many other 4-H'ers showed their non-animal projects at the fairgrounds, answering questions from judges and displaying their work. We are proud of all that the Kid accomplished. His insect collection was awsome! The Kid was chosen to represent Ross County at the State level with his insect project. He did a great job showing his project to the judges in Columbus at the State Fair and we are so proud of his accomplishments! The Kid also showed his Mille Fleur d'Uccle trio as his senior fancy chicken project this year. There were so many wonderful trios and we were so happy to see the poultry category grow. The Kid was awarded third place for his trio this year. We are very proud of how well he takes care of his poultry! 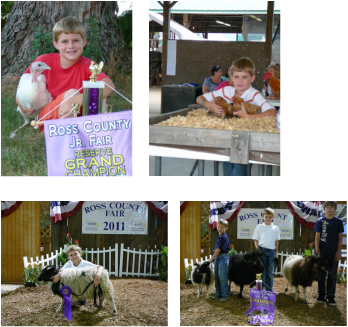 This year was the Kid's first year showing Mille Fleur d'Uccle chickens at the fair through the 4-H program. 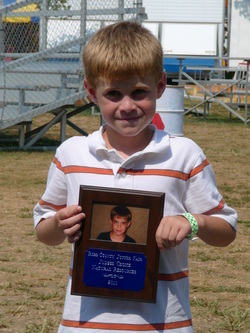 He was awarded fourth place in the junior fancy chicken division. He had a great time raising his flock from chick to chicken and is looking forward to continuing with his breeding project. This picture shows the Kid with the judge and another 4-H member who is showing for her last year before she graduates high school.